Adhirasam is a traditional tamil sweet prepared during Diwali. 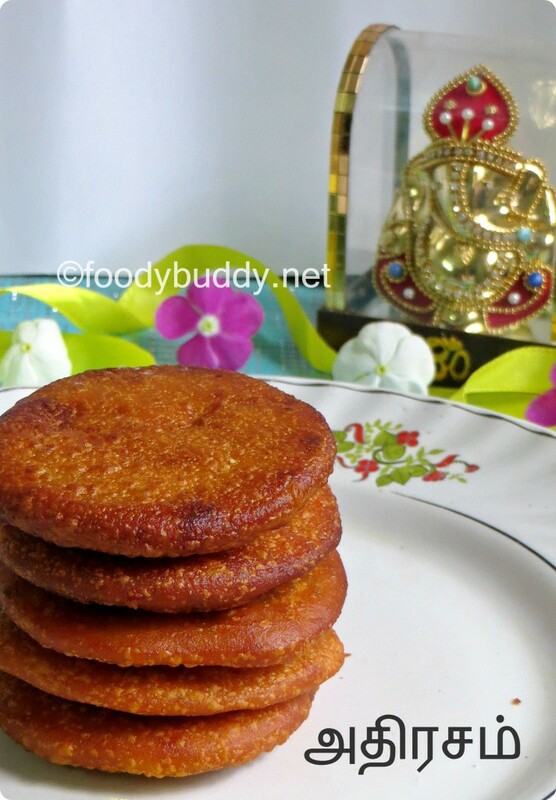 This delicious south Indian delicacy adhirasam recipe is made with homemade rice flour and jaggery. This is my all time favourite sweet and I love to eat grand snacks adhirasam. Making of adhirasam is a long time dream for me. Last two diwali, I tried it in my home it was a big flop. My mom makes best adhirasam so I learnt the secret of making adhirasam from her. 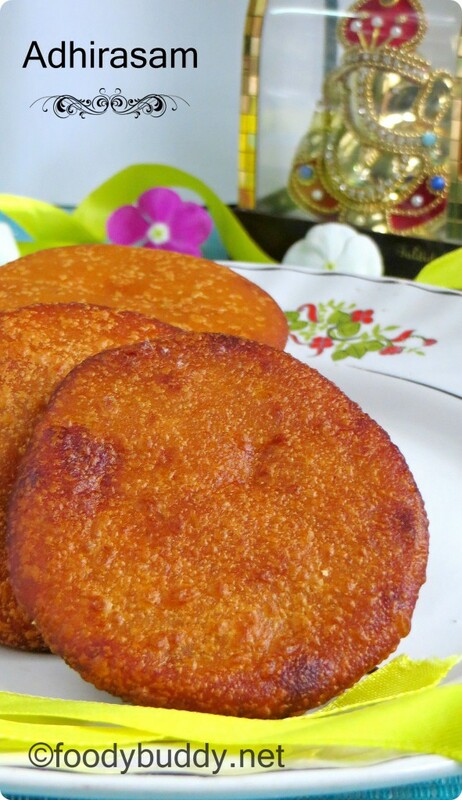 The secret of getting perfect adhirasam lies in the usage of homemade rice flour and jaggery syrup consistency. You can also make adhirasam with sugar. Also refer the tips section for more tricks to get perfect soft adhirasam. If you are a beginner, love to eat adhirasam, thinking to try at home. Then do try this diwali special sweet in your home. Wash and soak rice for 2 hrs. Drain the water completely and spread it in a clean white cloth, so that it will absorb the excess water. After 30 mins, it shouldnot dry completely. Moisture should be there. Grind it along with dry ginger powder and cardamom in a mixie to flour (not too fine not too coarse) and now sieve it. If you have rice mill near to your house, then grind it there for adhirasam. Take jaggery and grate it. I used pagu vellam which is available in stores to make adhirasam. To the pan, add grated jaggery and water to immerse. Bring it boil, after it completely dissolved, switch off. Filter it to remove impurities. In a pan, add filtered jaggery, start heating in the medium flame, stir occasionaly and keep checking the syup consistency. To check syrup consistency, take a cup of water, pour a tsp of jaggery syup into it, you can see fine thread in a beginning stage, when you touch it will get dissolved. 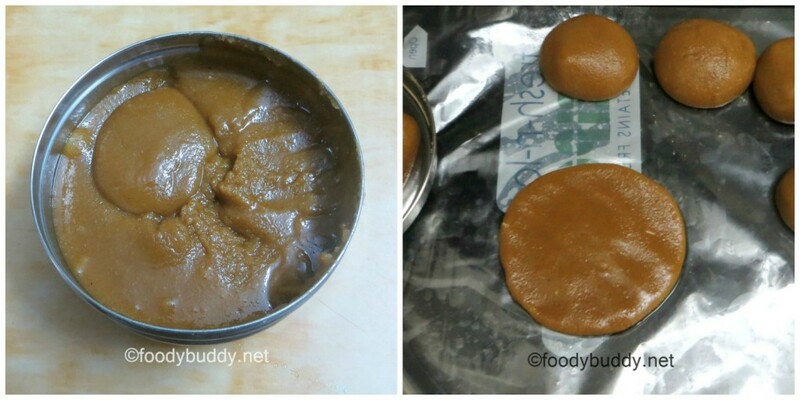 Later, when your jaggery turns thick, now pour jaggery syup in water, it won’t get dissolved, just collect it with your finger, you will get soft ball(uruttu patham), that is a right consistency, in that stage you can see lot of foam in jaggery syup. Just turn it off immediately. pour the flour to the jaggery syrup and keep mixing with a laddle. Dough should be loose. After 3-4 hrs, dough turn thick, just knead it and let it rest for 1-2 days. if you want to keep more than that, keep it refrigerated. But I left it for one day. Take a dough and divide into equal parts. Meanwhile, heat a pan with oil to deep fry, once the oil is hot, reduce it to medium flame. Grease the zip lock bag with ghee and flatten the dough with your hands. Carefully drop it in the oil. Fry it until it turns nice brown colour. 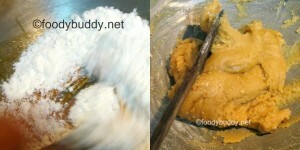 While taking out, use another laddle and press it to squeeze out excess oil. Place it in filter paper. Repeat the process for the rest of the dough. Hot adhirasam is ready to serve. Always use homemade rice flour to get nice adhirasam. If adhirasam split while frying, then you had added more jaggery to it. Dough should be loose, if it is tight, then you will get hard adhirasam. In that case, add little more milk or jaggery syrup. Resting the dough for atleast overnight, is important. Get paggu vellam to get soft adhirasam. Jaggery syrup consistency is more important, you should get soft ball consistency, if you exceed that stage, then you will get hard adhirasam. If you remove before soft ball consistency, then your adhirasam will get break while frying. Always cook in medium low flame for even cooking. Don’t fry it for longer time. Some raw rice needs more jaggery syrup, for safer side, always make little more jaggery syrup. If your adhirasam is hard, just microwave it for few secs. Don’t use store bought rice flour to make adhirasam. Use only homemade flour. Flour should be moist enough to make adhirasam. You can use any type of raw rice. Colour of adhirasam depends on the colour of jaggery.